How does coaching differ from my current work as a therapist?If I became a coach, what additional skills and expertise might I need?What sorts of markets might I work in and what sort of income could I expect?What are the implications if I decided to run a mixed practice of coaching and therapy/counselling?This book is written for qualified and experienced psychological therapists who are interested in what coaching may have to offer their clients or their practice. It considers what coaching is, the routes by which people have become coaches, the coaching client, coaching methods and the issues within running a mixed practice. This includes a thorough exploration of the points of difference between therapeutic and coaching models, including the nature of interventions, mind set of the coach and the structuring of the process. Aspects of therapeutic models which are inappropriate for coaching are highlighted as well as the elements which add a richness to it. 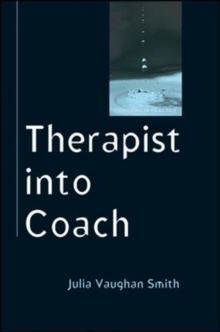 There are examples of dialogue between coach and client and short case studies throughout the book which illustrate the coaching process and exemplify the `voice of coaching'.Therapist into Coach provides key reading for psychotherapists, counsellors and psychologists who are thinking of widening the case mix of their practice, of moving into new markets or who want a different relationship with their clients. It will also help coaching trainers or coaching students understand the similarities and differences between coaching and counselling.